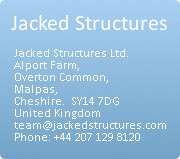 We provide a range of consultancy services for the concept, planning and implementation of jacked structures. The key to successful installation is in integrating the permanent work design and the temporary works that need to be undertaken during installation. These have to be designed to minimize risk and ensure work proceeds rapidly with the least delay and minimum soil movement. Our services are provided to owners, consultants and contractors. Conceptual design, planning and budgets to identify viable technical and economic approaches for a jacked installation which meet the client’s requirements is where many projects fall short of ideal.. 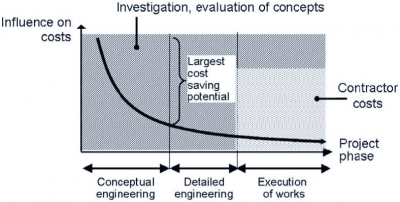 The importance of conceptual engineering is highlighted by the figure. 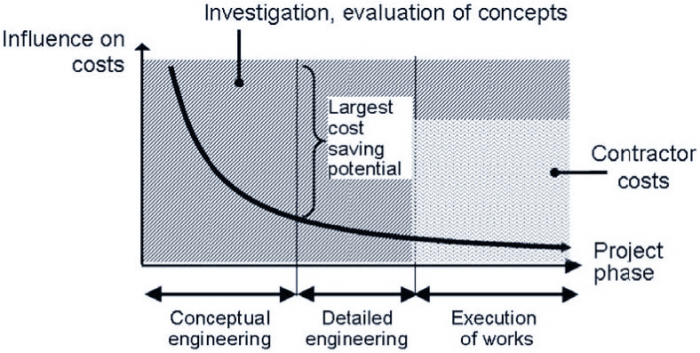 This shows the relative cost impact that can be achieved as a project moves from concept to execution. The preconstruction phase represents the smallest percentage of the overall project cost but has the greatest impact on the level of the final costs. With our extensive range of methods and techniques we can develop designs to meet the needs of the client and its location. Our approach is to gain an in-depth understanding of the site, the soil conditions, the client's needs and the restrictions and requirements of third parties such as rail and highway authorities. Only then can we develop a concept which often requires a combination of methods rather than a set approach. The importance of developing a concept that will fully take into account the soil and ground water conditions to ensure safe working and minimization of soil movement is essential and we have in house highly qualified geotechnical expertise. Minimizing disruption to the surface facility is a key consideration. The owner of the surface facility will not allow disruption. The occupation period needs to be minimized. The cover is too shallow for traditional tunneling. Environmental disturbance has to be avoided. The range of possible solutions are extensive and each one is unique to the location, conditions and restrictions. The chart graphically sets out options for installing underpasses below rail tracks where limited possession is possible and where not. Developing the concept into a detailed engineering scheme and program requires the permanent works design and the methods of installation to be integrated. This requires close cooperation between the respective design teams. Work is often undertaken on a "Design and Construct" basis and the lead contractor will be closely involved. The installation stage is the prime concern as once work is underway there is one chance only of getting it right. Our principal function at the design stage is to ensure that all aspects of the installation are designed and planned to ensure this happens. Incorporating the needs of the installation works into the permanent design. We provide various levels of management of the installation works. Our work involves developing highly detailed procedures and programs for the installation. With a set window of installation everything needs to be in place and operational to ensure that work is completed within the time frame. We work closely with consultants, contractors and specialist sub-contractors throughout the planning and installation. We believe management of risk should be based on risk identification not on avoidance. 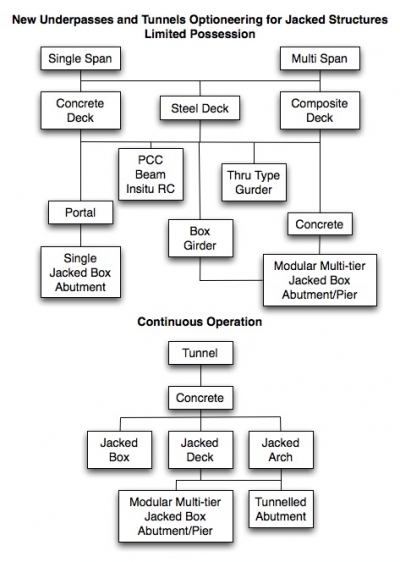 Unlike some tunneling systems the risks of a serious collapse with jacked installations are virtually eliminated. In jacked installations the shield is designed to advance ahead of excavation and to deal with any local soil movement at the face. The permanent structure is continually advanced behind the shield ensuring that the excavation is always fully supported. Where the risk of unstable ground conditions exists appropriate pre- stabilization techniques are used. These basic built in features ensures that both workers and clients are not exposed to collapse and the consequences.